Truffles are a type of fungus that grows underground near trees. Like other types of fungus, a truffle needs the nutrients, air and water supplied by a close association with trees or other plants to grow. Because of their subterranean nature and difficulty in harvesting, truffles can sell for extremely high prices. To find truffles, a truffle hunter takes a pig, dog or other type of fungivore into an area where truffles are known to grow. The fungivore exhibits a behavior when it picks up the scent of truffle and the truffle hunter knows it’s time to dig. Once the truffles have been extracted from the ground, they are cleaned and are ready to be used in cooking. Truffles have a distinct flavor and it takes very little shavings to add their distinct flavor to a dish. Many high end restaurants use truffles in their entrees and truffle oil is becoming widely available at local supermarkets. With the growing dominance of truffles in designer cuisine, it’s important for those with allergies to recognize the symptoms and take action before suffering an allergic episode. A food allergy can take many forms depending on the severity. A mild allergy may only result in itchiness and light discomfort. A severe allergy can result in difficulty breathing, seizures and even death. If you have a severe allergy to truffles, or any other food, it’s important to practice caution when dining out and always carry an Epi-Pen for emergencies. Many people who are allergic to truffles are unaware of their allergy because the food is so rare and because it is used so sparingly in dishes. Truffles are typically used as ingredients in dishes or as garnish rather than the main event, leading many to believe they are allergic to another portion of the dish and not the truffle itself. Fortunately, there are some symptoms you can keep an eye out for to alert you to a potential food allergy. Symptoms of a mild allergy include itchiness, redness of the skin – particularly the throat, face and abdomen, blemishes or hives all over the body, numbness and stomach pain. If you have a severe allergy, you may experience all of the same symptoms as a mild allergy, along with difficulty breathing, severe pain and loss of consciousness and even seizures. You may be at an increased risk for truffle allergy if you have a history of other food allergies, especially mushrooms or other types of fungus. Even if you don’t have any other food allergies, you could be allergic to truffles. The only way to know is to sample a piece of the delicacy and watch your body for symptoms of a reaction. 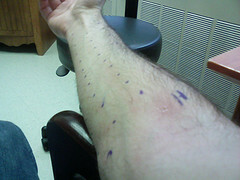 If you do start having an allergic reaction, you should immediately administer antihistamines. The antihistamines can stop the allergic reaction and alleviate your symptoms. For cases of extreme allergy, a trip to the emergency room may be necessary. If you suspect you have a truffle allergy, you should consult your doctor immediately for further testing and confirmation. Your doctor can provide you with emergency allergy relief medications if necessary.